NOTE: Each piece is made to order, please see below for information about turnaround time. If you own a high-end retail clothing store, you are probably already aware of how difficult it is to locate unique and interesting retail fixtures. We may have an answer for you. 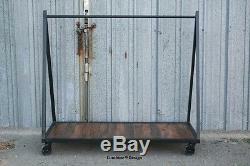 This is a Vintage Industrial/Mid Century Modern style Clothing/Garment Rack that we build. It's 100% hand-made and can be made in any size/configuration that you'd like. The base is made with beautiful reclaimed wood. We have several options of reclaimed wood for you to choose from, and will always have colors of light, dark and one in between. If you prefer new wood, we can stain it any color you wish. The color of the steel is black, but if you would like it another color, we can make it any color you wish at no additional charge. As you can see it has rivets along the bottom, and casters (which really add to the industrial feel). 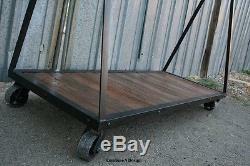 The casters also make it easy for you to move it wherever you want it. Please keep in mind that all of our items are made to order, and will be made to your specifications. This listing (and price) is for one with the dimensions of 60 L x 24 W x 55 H. If you would like your piece to made in a different size, just let us know and we will adjust pricing accordingly. 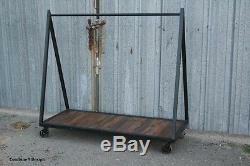 This piece would also look great as a garment rack in a loft or apartment. As I said before, each piece is made to order, so if you have any questions, or ideas for your piece, please dont hesitate to contact me. We create many other custom pieces in this and other styles, so, please contact me if you are looking for a coffee, end, or dining table, desk, or any other furniture. I would love to discuss how we can work together to design a unique piece to fit your needs. We make furniture for both residential and commercial applications, so if you are looking for furniture for an office, spa, salon, restaurant, bar, lounge, etc. In addition to countless wonderful homeowners and small businesses around the country, some of our past clients include companies such as. Linked In, Living Social, Wyndham Hotels, Trip Advisor, Hard Rock Hotel & Casino, Vans Shoes, Vibram Shoes, Mishimoto, Starwood Hotels, and Bose retail stores. Weve also been in numerous national publications and TV shows including HGTVs House Hunters, a nation-wide Verizon TV commercial, a nation-wide Microsoft TV commercial, NBCs About a Boy TV show, Dwell (for their Dwell Labs exhibit), Sound & Vision magazine, Living Spaces magazine, etc. Please be sure to see my other items, and add me to your favorites list. We are frequently adding more pieces. My items are handmade in custom styles and sizes. They have been described as: Vintage, Industrial, Mid-Century, Modern, Urban, Loft décor, Steampunk (Steampunk), Metal Art, Futuristic, Futurama, furniture, bedroom, end table, night stand. Nightstand, storage, cabinet, dark, black, urban, modern, rustic, steel, patina. Living Room, Dining Room, Media Room, Family Room, Kitchen. Check out my other items. Be sure to add me to your favorites list. 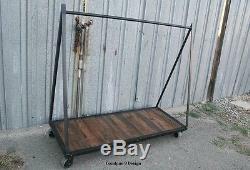 The item "Clothing Rack/Garment Rack. Urban" is in sale since Wednesday, June 26, 2013. 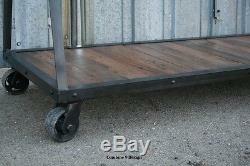 This item is in the category "Business & Industrial\Retail & Services\Racks & Fixtures\Clothing Racks". The seller is "combine-9-design" and is located in Houston, Texas. This item can be shipped to United States.